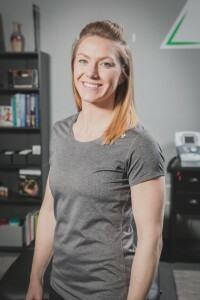 Fit2Perform is owned and run by Doctor of Physical Therapy, Erin Adams. Erin received her Doctorate of Physical Therapy from Ithaca College in 2010. She began her career with traveling physical therapy across the United States working in a variety of clinical fields over a three year span. It was during this time where Erin found her talents and specialties working in athletic settings with performance athletes of all levels. This makes Fit2Perform an ideal choice for all athletes. While working in California during the summer of 2013, she was introduced to the sport of CrossFit. Quickly impressed with results of Crossfit and the physical and mental challenge, she decided to focus on excelling in this sport and has stuck with it ever since. When she’s not working or working out, Erin enjoys all outdoor activities throughout Vermont. Erin is the treating physical therapist for Fit2Perform. Erin has worked in all physical therapy settings, however found her passion working with athletes from all backgrounds during her outpatient travel assignments in California. Erin offers dynamic physical therapy sessions for our CrossFit and athletic community. You will find her approach to physical therapy individualized and targeted at the whole body, not just the body part that is injured. To say that Erin cares about her clients is an understatement. She develops relationships with her clients of which are life long to keep clients active and healthy during all stages of life and activities. Erin is always seeking new treatment approaches and became a Certified Myofascial Trigger Point Therapist at the end of February 2016.